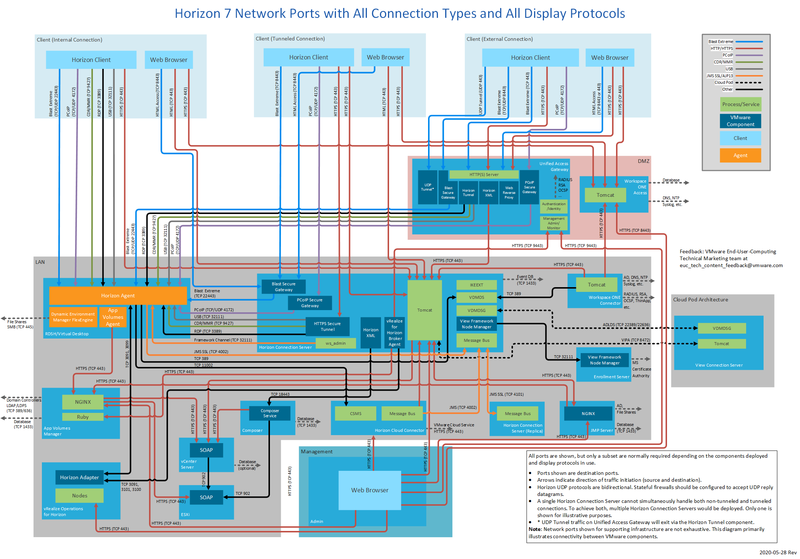 This document lists port requirements for connectivity between the various components and servers in a VMware Horizon® 7 deployment. Figure 1 shows three different client connection types and also includes all display protocols. Different subsets of this diagram are displayed throughout this document. Each subset of Figure 1 focuses on a particular connection type and display protocol use. The embedded diagrams (and those in the pdf) are screen resolution versions. If higher resolution and the ability to zoom is required, for example to print as a poster, click on the desired diagram using the online HTML5 version of this document. This will open a high-resolution version which can be saved, opened in an image viewer, and printed. • If Blast Extreme is the only display protocol used, the PCoIP ports need not be opened. • If VMware vRealize® Operations for Horizon is not deployed, ports to and from it can be ignored. Ports shown are destination ports. The source and destination indicate the direction of traffic initiation. Network ports for connections between a client (either Horizon Client or a browser) and the various Horizon 7 components vary by whether the connections are internal, external, or tunneled. An internal connection is typically used within the internal network. Initial authentication is performed to the View Connection Server, and then the Horizon Client connects directly to the Horizon Agent running in the virtual desktop or RDS host. The following table lists network ports for internal connections from a client device to Horizon 7 components. 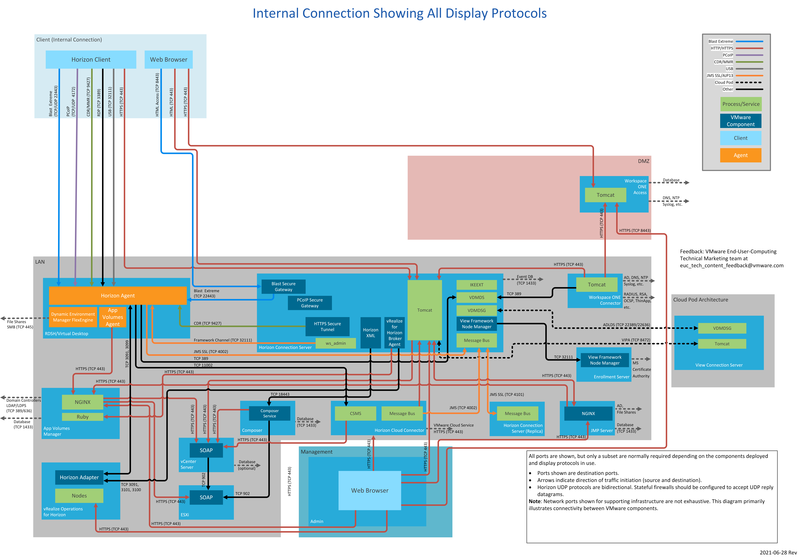 The diagrams following the table show network ports for internal connections, by display protocol. SSL (HTTPS access) is enabled by default for client connections, but port 80 (HTTP access) can be used in some cases. See HTTP Redirection in Horizon 7 in Horizon 7 Security. Optional for client drive redirection (CDR) and multimedia redirection (MMR). By default, when using Blast Extreme, CDR traffic is side-channeled in the Blast Extreme ports indicated previously. If you prefer, this traffic can be separated onto the port indicated here. By default, USB traffic is side-channeled in the Blast Extreme or PCoIP ports indicated previously. If desired, this traffic can be separated onto the port indicated here. Browser View Connection Server TCP 8443 Horizon 7 HTML Access. VMware Identity Manager Appliance TCP 443 VMware Identity Manager login and data traffic. Both 88 iOS single sign-on (SSO). TCP 7443 SSL certificate authentication. This port is required only when a connector is being used in inbound mode (outbound mode is recommended). An external connection provides secure access into Horizon 7 resources from an external network. A Unified Access Gateway or a security server provides the secure edge services. All communication from the client will be to that edge device, which then communicates to the internal resources. The following table lists network ports for external connections from a client device to Horizon 7 components. The diagrams following the table show network ports for external connections, by display protocol, all with Unified Access Gateway. Can also carry tunneled RDP, client drive redirection, and USB redirection traffic. TCP 4172 PCoIP via PCoIP Secure Gateway on Unified Access Gateway or security server. UDP 4172 PCoIP via PCoIP Secure Gateway on Unified Access Gateway or security server. Unified Access Gateway UDP 443 Optional for login traffic. Blast Extreme Network Intelligent Transport (BENIT) tries a UDP login connection if the client experiences difficulty making a TCP connection to the UAG. Blast Extreme via Blast Secure Gateway on Unified Access Gateway for data traffic (performant channel). Blast Extreme via Blast Secure Gateway on Unified Access Gateway for data traffic (adaptive transport). Blast Extreme via the Unified Access Gateway for data traffic where port sharing is used. This would be instead of TCP 8443. Security server TCP 8443 Blast Extreme via Blast Secure Gateway on security server. 8443 is the default but can be changed to 443 on the Unified Access Gateway. TCP 5262 Android single sign-on (SSO). The Blast Secure Gateway on Unified Access Gateway includes Blast Extreme Adaptive Transport (BEAT) networking, which dynamically adjusts to network conditions such as varying speeds and packet loss. In Unified Access Gateway, you can configure the ports used by the BEAT protocol. By default, Blast Extreme uses the standard ports TCP 8443 and UDP 8443. However, port 443 can also be configured for Blast TCP. The port configuration is set through the Unified Access Gateway Blast External URL property. See Blast TCP and UDP External URL Configuration Options. If you configure Unified Access Gateway to use both IPv4 and IPv6 mode, then the Blast TCP/UDP must be set to port 443. You can enable Unified Access Gateway to act as a bridge for IPv6 Horizon clients to connet to an IPv4 backend Connection Server or agent environment. See Support for IPv4 and IPv6 Dual Mode for Horizon Infrastructure. A tunneled connection uses the View Connection Server to provide gateway services. Authentication and session traffic is routed through the View Connection Server. This approach is less frequently used because Unified Access Gateway can provide the same and more functionality. The following table lists network ports for tunneled connections from a client device to the Horizon 7 components. The diagrams following the table show network ports for tunneled connections, by display protocol. SSL (HTTPS access) is enabled by default for client connections, but port 80 (HTTP access) can be used in certain cases. See HTTP Redirection in Horizon 7 in Horizon 7 Security. Blast Extreme to Blast Secure Gateway. The following table lists network ports for connections from a virtual desktop or RDS host, to other Horizon 7 components. Horizon Agent View Connection Server TCP 4002 Java Message Service (JMS) when using enhanced security (default). TCP 389 Only required when doing an unmanaged agent registration, for example, RDSH agent install without linked-clone or instant-clone component. vRealize Operations for Horizon * TCP 3091 Remote Method Invocation (RMI) registry lookup. App Volumes Agent App Volumes Manager TCP 443 Can use port 80 if not using SSL certificates to secure communication. TCP 5985 PowerShell web services. User Environment Manager FlexEngine File shares TCP 445 User Environment Manager agent access to SMB file shares. * VMware vRealize Operations for Horizon ports shown are for version 6.2. See the vRealize Operations for Horizon Documentation for earlier versions. The following table lists network ports for connections from a View Connection Server to other Horizon 7 components. View Connection Server Horizon Agent TCP 22443 Blast Extreme for a tunneled connection. TCP 4172 PCoIP for a tunneled connection. UDP 4172 PCoIP for a tunneled connection. TCP 3389 RDP for a tunneled connection. Optional for client drive redirection (CDR) and multimedia redirection (MMR) for a tunneled connection. Optional for USB redirection for a tunneled connection. By default, USB traffic is side-channeled in the Blast Extreme or PCoIP ports indicated previously. If you prefer, this traffic can be separated onto the port indicated here. vCenter Server TCP 443 SOAP messages. View Connection Server TCP 4100 JMS to replica View Connection Server for redundancy and scale. TCP 4101 JMS SSL to replica View Connection Server for redundancy and scale. TCP 32111 Used only during installation of a replica View Connection Server. TCP 389 Used only during installation of a replica View Connection Server. TCP 22389 Cloud Pod Architecture ADLDS - Global LDAP replication. TCP 22636 Cloud Pod Architecture ADLDS – Secure global LDAP replication. TCP 8472 Cloud Pod Architecture inter-pod VIPA. TCP 135 MS-RPC endpoint mapper. Required for Cloud Pod Architecture (CPA). TCP 49512-65535 MS-RPC dynamic client port range. Required for Cloud Pod Architecture (CPA) LDAP communication. See note below. TCP 1521 If using an Oracle database. View Composer TCP 18443 SOAP messages. Security server UDP 500 IPsec negotiation traffic. VMware Identity Manager TCP 443 Message bus. vRealize Operations for Horizon TCP 3091 Remote Method Invocation (RMI) registry lookup. TCP 3101 Broker message server – Send topology data. TCP 3100 Certificate management server – Pair. Cloud Pod Architecture (CPA) requires RPC ports between Connection Servers to allow for replication. The RPC port numbers are dynamically allocated after initial communication with the RPC endpoint mapper over TCP port 135. The following table lists network ports for connections from a Horizon Enrollment Server. Enrollment server requests certificate from Microsoft Certificate Authority (CA) to generate a temporary, short-lived certificate. The enrollment service uses TCP 135 RPC for the initial communication with the CA, then random port from 1024-5000 and 4192-65535. Enrollment Server also communicates with the domain controllers, using all relevant ports to discover a DC and bind and query the Active Directory. The following table lists network ports for connections from a JMP Server, to other Horizon 7 components. JMP Server Database TCP 1433 Microsoft SQL database (default port is 1433). Both 135-139 Microsoft file sharing SMB: User Datagram Protocol (UDP) and Transmission Control Protocol (TCP). Both 445 Direct-hosted SMB traffic without NetBIOS. The Horizon Cloud Connector is a virtual appliance that connects a Connection Server in a pod with the VMware Cloud Service. The Horizon Cloud Connector is required to use with Horizon 7 subscription licenses. The following table lists network ports for connections from a Horizon Cloud Connector. vCenter Server ESXi TCP 902 SOAP. View Composer vCenter Server TCP 443 SOAP. The following table lists network ports for connections from a Unified Access Gateway to other Horizon 7 components. Unified Access Gateway View Connection Server TCP 443 Login. UDP 443 Optional for login traffic. Blast Extreme Network Intelligent Transport (BENIT) tries a UDP login connection if the client experiences difficulty making a TCP connection to the UAG. Horizon Agent TCP 22443 Blast Extreme. Other authentication sources such as RADIUS. Default value for RADIUS is shown but is configurable. The following table lists network ports for connections from a security server to other Horizon 7 components. The diagrams following the table show network ports for external connections when using a security server, by display protocol. AJP13-forwarded web traffic, when using IPsec without a NAT device. UDP 4500 AJP13-forwarded web traffic, when using IPsec through a NAT device. TCP 8009 AJP13-forwarded web traffic, if not using IPsec. TCP 4002 JMS SSL traffic. The following table lists the network ports for connections from VMware Identity Manager to other Horizon 7 components. DNS servers Both 53 DNS lookup. NTP UDP 123 Time sync. SMTP server TCP 25 SMTP port to relay outbound email. OCSP TCP 80 Online Certificate Status Protocol. KDC UDP 88 Hybrid KDC. Database TCP 1433 If using an external Microsoft SQL database (default port is 1443). TCP 5432 If using an external PostgreSQL database. TCP 1521 If using an external Oracle database. VMware AirWatch REST API TCP 443 For device compliance-checking, and for the VMware AirWatch Cloud Connector password authentication method, if that is used. vapp-updates.vmware.com TCP 443 Access to the upgrade server. View Connection Server TCP 443 Horizon 7 integration. Domain controllers TCP 389 LDAP to Active Directory. Default, but is configurable. TCP 636 LDAPS to Active Directory. TCP 3268 AD Global Catalog. TCP 3269 AD Global Catalog. Both 464 Kerberos password change. File servers TCP 445 Access to the VMware ThinApp repository on SMB share. RSA SecurID system UDP 5500 Default value is shown. This port is configurable. Citrix Integration Broker server TCP 80, 443 Connection to the Citrix Integration Broker. Port option depends on whether a certificate is installed on the Integration Broker server. The following table lists network ports for connections from App Volumes Manager to other Horizon 7 components. App Volumes Manager vCenter Server TCP 443 SOAP. Database TCP 1433 Default port for Microsoft SQL. The following table lists network ports for connections from vRealize Operations for Horizon, to other Horizon 7 components. vRealize Operations for Horizon View Connection Server TCP 3091 Remote Method Invocation (RMI) registry lookup. Horizon Agent TCP 3091 Remote Method Invocation (RMI) registry lookup. TCP 3099 Desktop message server. Unified Access Gateway TCP 9443 Monitoring of Unified Access Gateway appliances. App Volumes Manager TCP 443 Monitoring of App Volumes Managers. The following table lists network ports for the administrative consoles in Horizon 7. The following diagrams display network ports for connections, by display protocol (Blast Extreme or PCoIP), and for HTML Access client connections. Graeme Gordon, Senior Staff End-User-Computing Architect, EUC Technical Marketing, VMware, wrote this document and created the accompanying network-port diagrams.